Lloyd Mats are the safest car floor mats in the automotive floor mat industry. Never worry about the safety and security of your family. Lloyd Mats are reliable. Lloyd Mats has been involved in the evolution of safety in the car floor mat industry, well before the auto manufacturers and the overall aftermarket floor mat industry in general. The safe use of floor mats is Lloyd Mats prime goal. Lloyd Mats is a pioneer in the development of anchoring devices to keep floor mats safely in position in the floor of the vehicle. 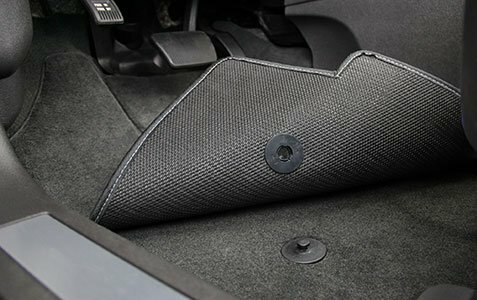 It is a prime directive of Lloyd Mats design and manufacturing process to keep our floor mats from interfering with any controls, such as brake, accelerator, or clutch pedals. Lloyd Mats are also carefully shaped to avoid interference with seat movement and cargo storage devices. Be comfortable as well as safe. All Lloyd Mat sets involving driver floor mats come equipped with mechanical anchoring devices. Lloyd Mats are compatible with anchor hardware such as hooks or posts, provided by the auto manufacturer. If vehicles come without anchors on the floor from the auto manufacturer, Lloyd Mats provides an easy to install hook and grommet system to keep our mats in place. Lloyd Mats are also carefully designed and constructed so the mat fits perfectly in the contours of the vehicle. The snug fit of Lloyd Mats also inhibits floor mat movement.